I think that everyone has “those” foods that are areas of temptation, or weakness, or just plain old habit. Most people list things like sugar (cough, cough… chocolate) or salt. But a lot of people also have drinks as an issue… Route 44 Dr. Pepper is one I hear a lot, mocha frap from Starbucks, etc. For me… it’s milk. Good, fatty, whole milk. Back when I used to work out I would have a glass after a good run when most people would drink water. My best friend used to tease me about coming over and having a glad of milk and a handful of Hot Tamales candies. In fact, her mom kept them stocked with both for when I would come over… which was often. Well, the other day I was in a bit of a daze as I was making my coffee (which is not entirely that odd seeing as how I am half-asleep when I make my coffee most mornings), and I poured whole milk into the mix instead of the almond milk that I have in my coffee every other morning. Once I realized it, I wasn’t going to pour out that precious milk (two young boys in the house… we go through a lot of milk) or the even more precious… coffee (two young boys in the house… need I say more?). So I drank the coffee with whole milk in it. No biggie. It was actually kind of gross. 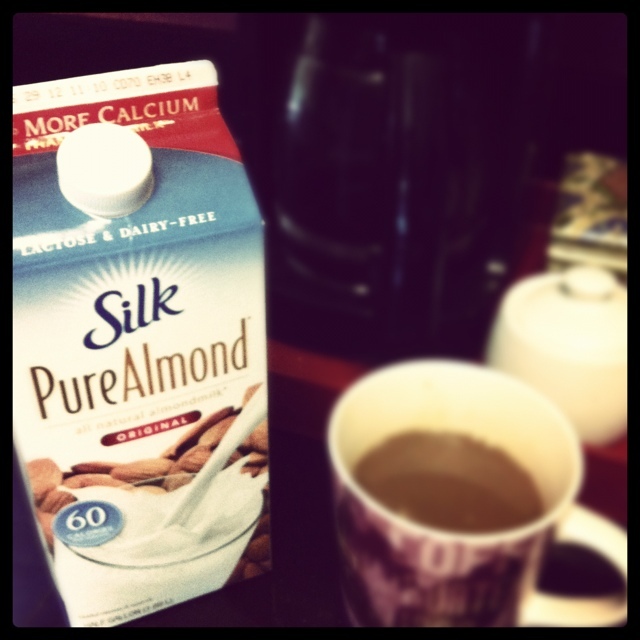 I mean… in comparison to my coffee with almond milk, which has like… flavor. It was kind of cool though how this life of sacrifice is actually better than my normal life. Again like I mentioned yesterday, I would have missed out on a lot of things, both spiritual and “earthly” if I had not done this covenant. And honestly, I’m not sure of a scripture to put with this one (comment below if one comes to your mind). It just makes me think of how we just don’t see… the whole picture. And by that I mean, there I was for years thinking that whole milk was kind of the end all be all for drinking in coffee. But… it wasn’t. There was something better out there. And I think that is what this covenant has shown me… there is so much about this world that I haven’t discovered, and might not ever discover… without God showing me. But it took me committing to Him, allowing Him to break down this wall inside of me… in order for me to see that the grass IS indeed greener on the other side if HE is the one that takes you there. It just makes me want to covenant with Him about… everything! So that He can show me how lame my “whole milk life” is (that I thought was oh-so great)… and reveal to me how amazing an “almond milk” kind of life can be (which I don’t even know exists)! Ya know… a while back a friend of mine and I were talking about getting gray hair. 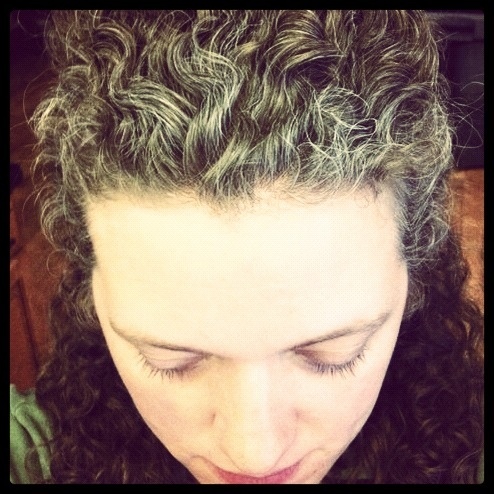 I’m 33, and most 33-year-old women are worried about getting in some gray hair, but not me. I’ve known since as long as I can remember that I would have a full head of gray hair when I hit my early thirties… happened to my dad and happened to his mom. Honestly, I’m a bit of a free spirit and so I’m actually totally cool with it! I mean… I have a big ol curly fro!?!?! What could look cooler than that? Oh, a big ol curly GRAY fro!!!! Anyway, her comment about her gray hair was that she would have to dye it because she was afraid of how people would perceive her. And this is coming from the girl that never cared how people perceived her. But now she’s a counselor, and well… when you are at a point where you need to go see a counselor… you either want a friend-type counselor or you want a wise-sage-type counselor. So, I can see how if she is the friend-type counselor then having gray hair would be… well, it wouldn’t match up with her counseling style. But it did make me a bit sad for the rest of humanity… because there is like this huge stigma about gray hair. Personally, I think gray hair is beautiful, and it also indicates wisdom and the blessing of having lived to be older than 13! Here is my favorite verse about gray hair, by the way… “Gray hair is a glorious crown worn by those who have lived right.” Proverbs 16:31 So, obviously, I am living right!!! Haha! A few days ago some kid that I used to teach posted a tacky photo on Facebook of a very, very overweight woman in a bikini. (Why I am still “friends” with him on Facebook and a ton of other people is a post for another day… and another blog.) And it just made my heart hurt… a) because of the burden that poor woman feels because of food, and b) because overweight people are just… mocked by the world. And being mocked… well, it hurts. So much of my own insecurities are remnants of when I was mocked as a little girl in elementary school because I was “big”. Looking back at pictures, I wasn’t big… I just wasn’t tiny. But it didn’t matter… I had yet to learn that my identity was not in what a bunch of little kids would say to me, but that my identity was in Christ and what He thought of me. And He could absolutely care less about my exterior! But as I grew up and stayed not-tiny, and then as I truly did start to gain weight and become “overweight”… I still struggled with who I was. Until I really started going to church in high school and I had the most uh.maz.ing. youth minister (shout out to Grant Byrd) in the universe that impressed upon us day, after day, after day that Jesus was all that mattered when it came to opinions. And, well, I fell in love with Jesus pretty darn quick. Of course, I was yet to realize that He could free me from this burden of food that I had been dragging along with me for years, but at least I allowed Him to start freeing a bunch of the burdens I was carrying in my soul. The other night I was looking through all of the status updates and checkins on Facebook and I’ll be honest… I straight up got depressed. There I was at home, treating my head with lice shampoo, and all these people were traveling, or hanging out together, or watching movies that I hadn’t seen. I started to feel really, really bad for myself. about myself. about my life. Then all of a sudden it hit me… I don’t want to look at this. I don’t want to see all of this. If I weren’t on Facebook then I would have no idea that people were even going out. I would have been happy… okay, maybe not happy. I mean, after all, I was treating my head for lice… and that’s just not fun. But I would have been content. And content is really, I think, the best spot to be in emotionally. And I realized that I didn’t want to be depressed. I identified that Facebook was making me depressed. And then I thought, what would make me happy? I know that sounds hokey and a little “holier than thou” but it was true. I knew that out of everything in my life… and I mean ev.ery.thing… that the Bible was the only thing guaranteed to give me joy. or at least peace. or at least… contentment. No need to go binge myself on Oreos. or hummus. or feta cheese. or tortillas. or whatever. I didn’t need to be appeased or soothed. I was just content, and in a way, that is far more filling than any meal. 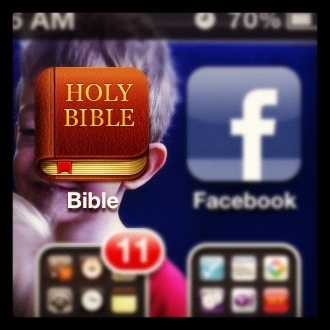 And certainly way better than Facebook. For my “birthing day” treat (a tradition that my husband’s family does to honor the mother that delivered the baby on each birthday), my husband got some sushi for me for lunch. I love sushi but I can never justify going to get it and we never tend to go out to eat and get it. I often tell him to go with his buddies to the sushi buffet instead of on date night with me because it is such a rip off for me to go… I never eat enough to make it worth all the money! Anyway, I ate a little bit of it at lunch that day and it was yummmmmay! 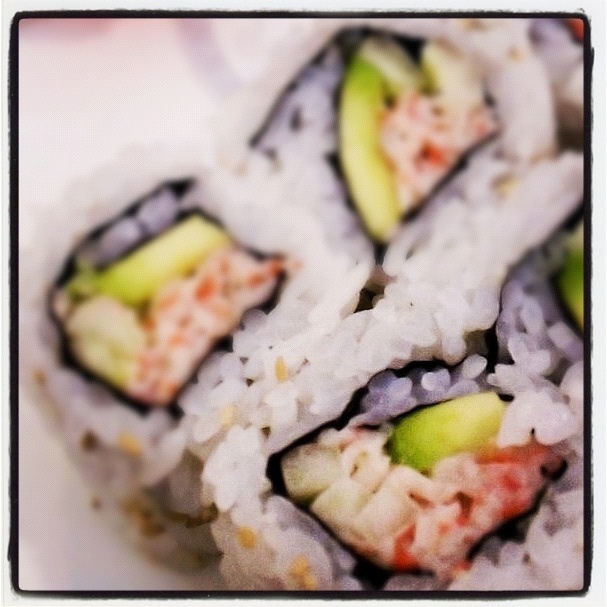 But I have learned that sushi makes me very full, very fast… so I can’t eat a lot of it. Luckily, I didn’t eat a lot of it that day. Later that evening after the birthday party, I was pretty tired and I really didn’t want to do the dishes or pick up, so I sorta defaulted back to my old “stall” technique and I went and got out the leftover sushi to finish. I sorta rationalized it to myself by saying that I hadn’t gotten to really eat any dinner because none of it was on my covenant (which I talked about here), but when it came down to it, I knew that I wasn’t really that hungry. Of course, then commenced a little internal battle… but luckily, those verses popped back into my mind that have helped me to honor God with self-control over and over again. They are probably some of the most important verses anyone needs to know for the covenant. And I know that I keep bringing them up, but I keep bringing them up because the Holy Spirit keeps bringing them to my mind. And those two verses keep helping me to make the right choices on this covenant. Because I want to honor God. I want for Him to receive glory… and I think that He does through my weight loss and through my telling people about how I’m losing weight because of Him. Today was a “me” day. And ohhhhhhh how nice those “me” days are! My parents watched the boys for me so that I could go get a hair cut and, well, just not be in constant “mom mode” all day. As much as I adore my boys, I also adore… me. And I like to spend time with just… me. So I dropped them off at my parents house this morning, and went and got my hair cut. I was kind of craving a parfait but didn’t have time to snag one before hand (which I was glad about later). After that I had decided already that I was going to try to find some shoes and a few shirts and tops down at the outlet shops near us. I went into GAP cause it was near where I parked and I have a friend that wears GAP stuff and I always think she looks classy… and I grabbed a few things that I thought looked cute… both size 10 and 12 in shorts and a few medium tops. a. I had not been shopping anywhere but Ross in ages and each store has its own “protocols”… and for some reason not knowing how many outfits I can take in, if I have to wait for an attendant, should I knock on the door or not, etc. all makes me nervous. b. I had a pair of size 10 shorts. I was about to find out if my size 10 “moment” the other day was just a one-dress deal or if I would be able to wear more size 10s. Instead of trying on the 12s first to see if they were too big I just went for it with the 10s. And… they. fit. perfectly. I grinned at myself in the mirror and said a quiet “Thank you Jesus”… and then like all good iPhone users, took a pic of myself! And then I tried on another pair of 10s and they fit (but looked hideous). But I got a couple of other shirts and totally thought to myself, GAP is gonna be a good place for me: good clearance rack, trendy but classy clothes options, good “cut” for my body type. But I’ll admit that I was grinning as I walked out of the changing room. And still grinning (and a bit giddy) as I checked out. Still grinning as I walked around the outlet stores. 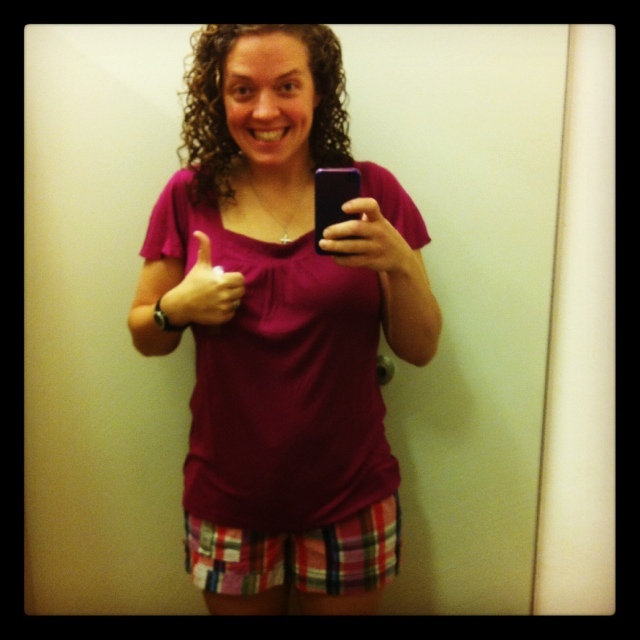 Annnnnnnd, yep, grinning… as I walked into American Eagle, J.Crew, Tommy Hilfiger, and Puma. And everywhere I walked I thanked God for the restrictions that had brought me so much freedom. I thanked Him over and over again for that freedom. On my way to Old Navy on the other side of the highway, I decided that I would stop by Paradise Bakery (which I love) after getting a few things. But as I walked out of Old Navy (with several more size 10s and some medium tops), I was just so overwhelmingly thankful to God. Like I wanted to show Him how thankful I was. We tend to fast out of obligation, or heartbreak, or concern. In fact in looking for a verse or a time that someone in the bible fasted because they were blessed, I kept coming up with people fasting because they had messed up and wanted God to forgive them or because they were in mourning for one thing or another. But I can never think of a time that I have thought- wow, having such a great time right now… I should fast. Fasting because I’m blessed instead of fasting in order to be blessed. It was just such a new thought for me. But it was great! I thought even more and more about His blessings every time my stomach growled. I was so glad that I had missed breakfast and then passed by Paradise Bakery, so that I could have those fasting moments with Him. 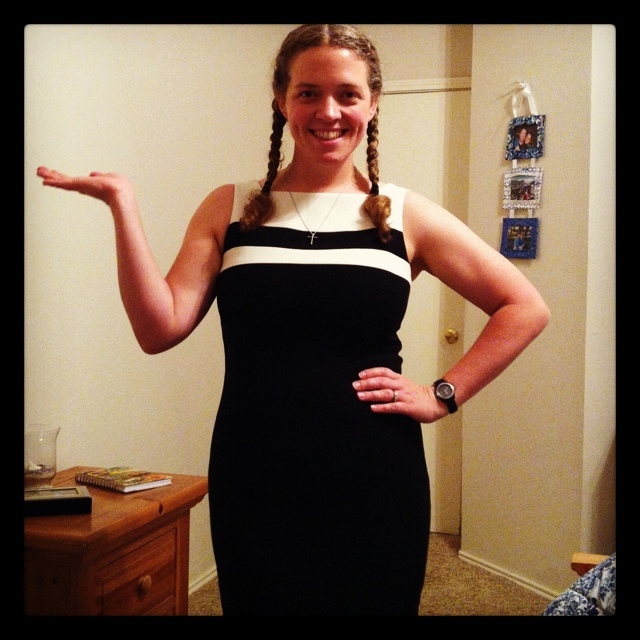 And it helped me keep my focus on the One that made that size 10 possible. I didn’t once look at myself and think, “Wow January. Good work.” Because I know that it was only by His strength that I was able to lose weight. And that’s why I was so pleased with doing that little “blessing-fast”… giving Him my thanks through a sacrifice… makes me think of the One that did the same. Last night my husband needed me to run an errand for him after my boys went down for bed. It’s kind of a good thing he asked because if it is just up to me I never want to leave when I put them down… I just want to veg out (haha… that’s never been funny to me before… but “veg” out… like be lazy and eat a lot of vegetables… haha… ha… h… no? Not that funny to everyone else… okay… hehe), but every once in a while it is good for me to get into mainstream society without anyone else. I don’t know why… maybe it just makes me feel a bit like… “me” instead of “mommy/wife/maid” which is what I kind of start to feel like the rest of the time. So, while I was waiting for him to find the empty box of labels that he needed me to get more of, I started thinking “Ooooo, what special treat can I get for myself while I’m out?? ?” Ya see, before when I would leave by myself at night, it was allllllways the perfect time to sneak eat something that I would never dream of eating in front of my husband: premade cookie dough (yeah, I really had an issue with cookie dough), a chocolate shake from Sonic, a candy bar, ice cream, a box of super chocolate chunk cookies… oh, there was a big ol list of things I would get. Oooooooo… one of my favs was when Walmart used to make their own chocolate peanut butter cups… they were divine. I probably would have turned diabetic lonnnnnng ago had they not stopped making those! I literally had to take a second and evaluate… I mean, wasn’t getting out on my own the real treat? Did I really need to get a… a something… in order for it to feel special? There was no need to sneak eat anymore… I wasn’t trying to eat anything shameful. What I could eat while out running errands I could certainly eat at home without being embarrassed. It just reminded me again how so many of these eating habits are totally engrained within me. I wasn’t craving anything. I wasn’t hungry. I wasn’t even thinking about food. But I just haven’t been out by myself enough for the process of retraining to get any practice, so my mind (very quickly, I might add) just went right back to what it was used to. I love the way that verse puts it… I searched for “old ways” and this popped up and was just perfect… cause wanting to get a treat is like “slipping” back into old ways. It’s not a direct, purposeful “fall”… it is a slip. But my favorite part is the sass at the end “you didn’t know any better then.” Although I kind of feel like I did know better before… I didn’t really understand before the true depth of what I was doing to myself and to my soul. But I did get myself a treat. 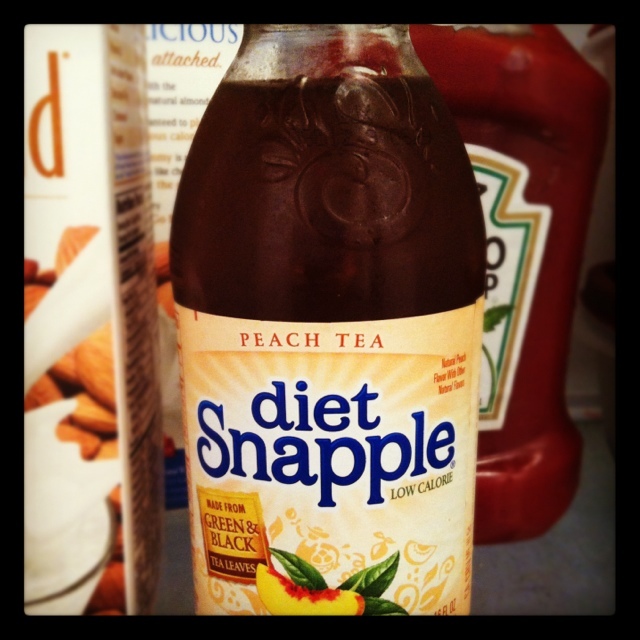 A Diet Peach Snapple… but not one for last night… one for today (when I was supposed to take my kids to IKEA). My two year old got sick though so it’s just sitting in my fridge. But I’m kind of glad that it is… just a reminder that even a “treat” can wait. It’s just a thing of this world… it’s no biggie to have that tea last night, today, or tomorrow… or never. And that attitude towards food… well, my friends, that. is. freedom. I haven’t been very… good… about taking “real” pictures of my kids the past several months. Okay, so I have been horrible about it. My iPhone is just so totally convenient, so I never remember to take my “real” camera… and I kept forgetting to charge it whenever I would take it to an “event”. Thank goodness my mother goes to most of the “big” events in my life and she always remembers her camera, so I often just piggy back off of her pics! Anyway, I did finally charge my camera and take pics at my son’s preschool graduation and at my toddler’s birthday! And I was just so stinking proud of myself that I put them on Facebook (which I also haven’t done an official “album” in a while… most of my pics are mobile upload pics)! Well, in doing so, I had to go through and choose which pictures I wanted, because… come on. Let’s all be honest here. It don’t matter if there are 37 people in a picture and alllllll of them look fabulous… if I don’t look good then it’s not a good pic. Haha! So, I went through and weeded through some of the less desirable pics of me and others there. And I love that it was subconscious… that I never really thought about the fact that I was feeling “unconcerned” about my looks. I was just… well… unconcerned! To look back on that now at the end of the day, well, it’s just… cool. In fact, I’m kinda smiling to myself right now. Kinda… feeling the joy.